Marriages are made in heaven but mad on earth! e) I am based out of Gurgaon! 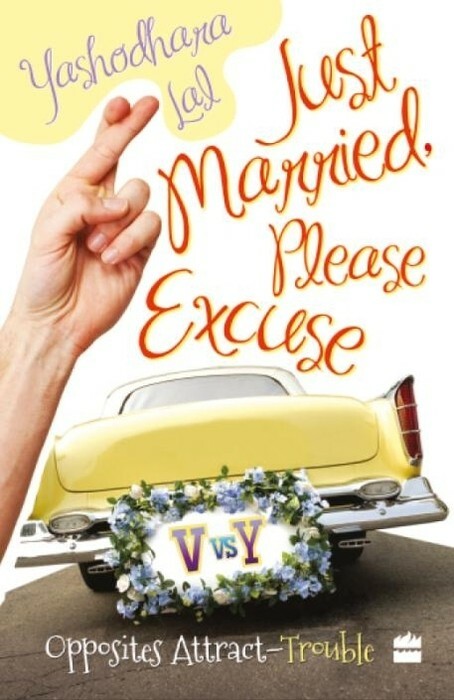 I have recently finished writing a piece on Indian marriages (link) and stumbled upon this lovely book- "Just Married, Please Excuse", courtesy Indiblogger team. Looks like getting married or not but writing on marriages is heaven made / send for me. I believe this book is just written for me and I just can't wait reading/ gifting it. Let’s cut the preamble short and make it simple for Yashodhra (awww the cute names she's given to kids & that lovely papad pic on her blog), here we go…. February 1976, Ms. Bansal (the “bride”) married Mr. Khetan (the “groom”) and moved in to his then family house in Bihar, in a city totally unknown. She embarks upon her new life with many dreams in her eyes and many apprehensions in her heart. The groom’s family has long migrated to USA and that’s the reason she could not get the chance to meet many members of his family including his younger brothers (the “brother in law”). The shy and coy bride was looking forward to some good interactions with family and their acceptance. “Kyunki saas bhi kabhi bahu thi” was not existing those days; the culture at in laws house (esp the joint family setting) was still highly formal and very-very demanding. It was then the “just married” bride was taken for a prank that still humors many of them. Apparently, the “younger brother in law” had a close resemblance to the groom and everyone in the house insisted the bride that he is the groom. Those days, brides did not have the liberty of meeting the grooms before marriage but Ms Bansal met him once and clearly remember face. After all, He was the guy who after meeting Ms Bansal declared that if he will marry, he will marry only this Ms Bansal and no one else. Such a flattering moment, how can a girl ever forget? She was sure that he is not her husband but all the ladies were adamant and up on prank, they hid the groom in other room, made the brother in law wear shirt of groom and created situations to make the new bride believe that her brother in law is the groom. The bride was befuddled and at one point was almost about to be confused when an elderly lady intervened and asked other ladies to stop the prank. The actual groom came out from hiding and everyone burst into peals of laughter. My mom aka the bride aka Ms Bansal aka now Mrs. Khetan heaved the breath of relief. She couldn’t help but smile on such mischievous act of the new-new family. History repeats itself and how. Years later, her darling daughter (yours truly) was born and for some upbringing reasons she was sent to her maternal grand parents’ house in faraway MP, now Chhattisgarh. With most loving Nana, Nani, 3 uncles, one aunt and no children, I became the pampered child of the household. It was somewhere in 1980s when a wedding proposal for my aunt has come. The prospective groom’s family came to see the bride over a lavish “meet the girl with Chai ka kettle in hands” ceremony. More than the bride, I believe they saw the magnificent house, my Nanaji’s solid reputation, business hold and the girl was approved. They also liked me so much that they asked my nani, my hand for one of their youngest son (nicknamed Kaju). I was like all eeeks! That Kaju boy looked so stupid and how dare they thought of this, leave alone asking. I ran to my eldest uncle and asked him to send off them as I do not want to marry my masi to their family. My uncle laughed and asked me to ignore them. He ensured that I don’t have to deal with this boy and the next time they repeat such thing, he will definitely deal with them. The kind, little, big hearted me was pacified and bade them forgiveness. Half heartedly, I agreed for my masi’s marriage. I was sad to let her go. Now the whole family came but not the groom. We saw him in picture and then on the wedding day. The wedding took place over lavish ceremony and bride was sent to her in laws house faraway in UP. There is a post wedding ceremony where in few days after marriage the bride comes to her home for some rituals. Couple of family members was sent to the groom’s house to bring the bride back to her parental house and I was the part of the entourage. I was barely 7-8 years old and such a talkatative. When I first met my Vijay Mausaji (my aunt’ husband), I immediately gelled with him and went on talking for hours bragging about the qualities of my caring and workaholic maasi. He kept smiling all the time, paying sincere attention to me all the while doing some household work. He asked whether I have seen their house or not and met their big joint family. I nod in approval and he took me around showing the place and family. I was so pleased to have such a warm and affable husband for my aunt and all my worries ceased on. It was then, he introduced me to his mom who asked me who all I met. I said all the names clearly and she asked me, did you not meet your Mausaji and do I like him or not. I was like yes I did and we spoke for hours. She was surprised when? He just returned from his Benaras trip 5 minutes ago. I said no, he is here, he bring me to you. It was then I knew that the person, who I was chirping to since morning thinking him to be my uncle, is actually his younger brother who looks very similar to him. She was even more surprised to know that he spoke to me for hours wherein he is known to be very strict, hardly interacting or smiling types. Another peal of laughter went around and even I couldn’t stop smiling over the entire incidence. Such events are ice breakers and sometimes is instrumental in bringing people closer. Like good memories they stay in our chest of jewels and linger on. So all of you who have “Just married”, “please excuse” such pranks. Take it with chin high and revel in the joy! No joy like newly wedded, trust me and Good luck. I hope you liked my post. Very hilarious. Looks like your whole family (including extended family) loves Shakespearean plays, especially Comedy of Errors and Twelfth Night. Really? Not much idea...just an info from mom and another one from my memories. Both of these Shakespearean plays are comedy. They both involve mistaken identity. So I referred these 2 plays since both the incidents in your post are about mistaken identity. Yup...I know about comedy of errors...twelfth night was one with happy ending right? Hmmmm...I need to find out...just got an amazing idea for a blog..working on it...want to post before 11 today..hope u may like it...you game? Thanks for participating :)...and yes, I look forward to your review as well! Cute stories, by the way :) - I like the fact that you took the trouble to ask Mom! BTW, I really loved ur pic (u n papad) on ur blog! Its awesome click!